Busy lifestyles and/or circumstances often keep us from spending time with the Lord on a regular basis; but, spending time with God is VITAL in helping us keep our focus on what is really important. "When you spend time with God, something incredible happens. As you take a few moments to pause from the stress and hurry of everyday life to focus on God and His plan for you, you become more centered, refreshed, and at peace. Meeting with God every day transforms you. And as you grow closer to Him, you'll have access to His guidance and wisdom for all the daily decisions you face. That's what the inspirational readings in this book are all about: renewing your soul so you can better understand yourself, your world, and your God." 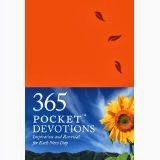 The book has one devotional for every day of the year. Each devotional contains a Bible verse and a reflection on a specific topic such as peace, forgiveness, delighting in God, trusting God, joy, wisdom, trials, and blessings. It is a small, pocket or purse-sized book with a soft, flexible cover that makes it easy to carry with you wherever you go. It also has an attached ribbon bookmark to help you keep your place. I like the fact that you can choose to read the devotionals in the order they are in the book, or you can choose a topic from an index in the back of the book and read one or two devotionals on that topic. When time is short, this is a good little devotional book to help you remain connected to the Father as you read one of the devotionals, reflect upon it, and take a few moments for prayer. NOTE: Tyndale House Publishers has provided me with a complimentary copy of this book for review purposes. I have shared my own opinion. If you aren't interested in playing that's AOK with me! I understand!